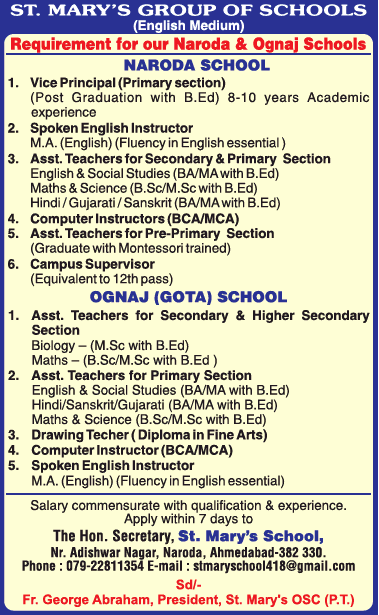 Are you searching for Faculty Teachers Gujarat 2019? 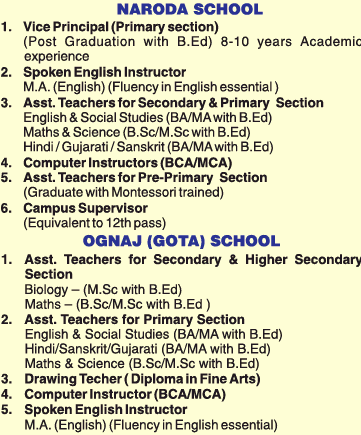 A School based in Ahmedabad named St.Mary's Group of Schools, Ahmedabad has advertised in THE TIMES OF INDIA newspaper for recruitment of Teachers / Vice-Principal jobs vacancies. Interested and eligible job aspirants are requested to apply within 07 days from 27th March 2019. Check out further more details below. About School : St. Mary’s School is a Christian minority; self financed, co-educational English medium School, affiliated to Gujarat Education Board, managed by the St Mary’s Orthodox Syrian Church (Public Trust) Ahmedabad and has emerged as one of the best institutions in the city of Ahmedabad focusing on a value-based education with all modern facilities.